This study of the 23rd Foot arose from Donald E. Graves’ biography of Lieutenant General Sir Thomas Pearson entitled Fix Bayonets! Being the Life and Times of Lieutenant-General Sir Thomas Pearson, 1781-1847 that was published in 2006 and after reading this I will certainly search this out. The book is based on a rich regimental archive of correspondence, memoirs and other documentation which have been used by a writer with an expert eye and the ability to tell a coherent story within the larger political and social background of the period. This is often missing in other regimental accounts. This book stands out from most books published over the last 20 years or so. It is well researched and has a light conversational tone without the clutter of endless footnotes where interesting facts are hidden by less able writers. It does not glorify war but informs the reader of the actions of the 23rd Foot but the context to which they fought and died during the Napoleonic Wars. The whole life is explored and not just the battles. Being a soldier was more about being transported by ship, in garrison and the unimaginable hardship of campaign. The Royal Welch Fusiliers, the 23rd Foot had a long and splendid history dating back to 1689 when it was raised as Lord Herbert’s Regiment. In 1702, when it was re-titled the “Welch Regiment of Fusiliers,” this was the earliest regional affiliations in the British Army. The 23rd Foot was one of the most travelled of regiments. It fought with distinction during the War of Austrian Succession and the Seven Years War before its unstinting service during the American War of Independence from the hint of troubles in 1773 until the bitter end in 1783. These are covered by Mark Urban (2007) Fusiliers. Eight Years with the Redcoats in America that was recently published by Faber and Faber. Each chapter is prefaced by the lyrics of contemporary soldier songs which is a lovely addition with the statue of the 23rd Foot as a watermark. Below is a summary of the chapters that shows the breadth of the book and the story of this fine old regiment. On 11 October 1810, 1/23rd departed Canada for Lisbon to become part of Wellington’s Army. [p114] They were first engaged at the battle of Redinha (Mar 1811) [123-4]. On 15 March 1811, the 1/23rd Foot marched south to join Beresford who had been ordered to take Badajoz. [pp 126-131]. There are fine maps show clearly the campaigns and it is good that they are close to where the text discusses them. The diagram map on page 139 could have better distinguished between the 1/23rd Foot in the Fusilier Brigade and the 23rd Portuguese Line Regiments in Harvey’s Brigade. This took me time to realise when I consulted OOB in Oman. The excellent contemporary drawings in with the text are a very pleasing addition to the 16 pages of black and white plates in the centre of the book. Most of the characters that colour the book with the extracts from their diaries and memoirs are shown. The accounts include Drummer Richard Bentinck; Lieutenant George Booker; Major Jack Hill; Private Thomas Jeremiah and Lt-Col. Harvey Ellis who led his Fusiliers in some of the most famous actions of the time only to be killed at Waterloo. This research is based firmly on diaries and period documents but they improve rather than distract from the strong narrative line. 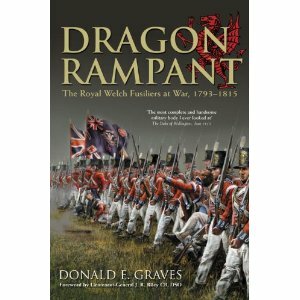 The easy-to-read and entertaining style is hard to put down makes this an accessible introduction to this fine regiment but the Peninsular War for the re-enactor and amateur historian alike. Reviewed by Dr Stephen Summerfield, Loughborough University.